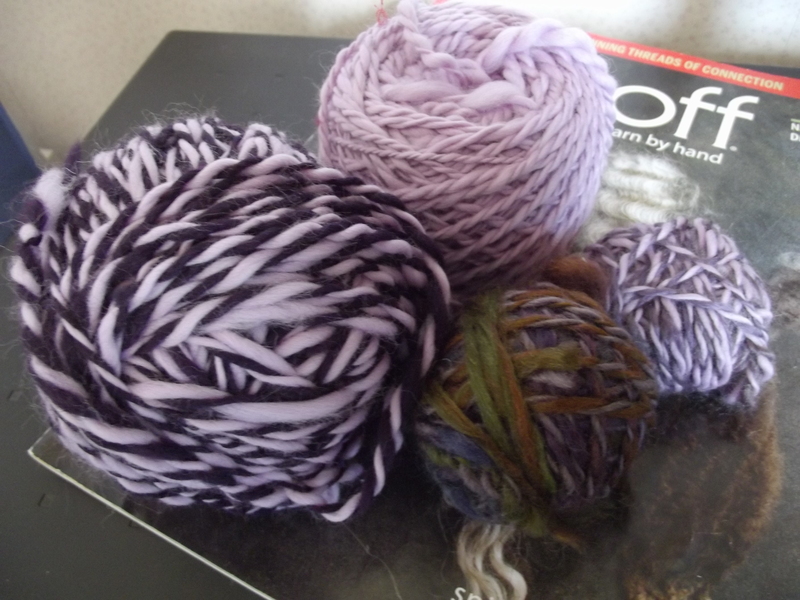 For my new project, I am using a selection of yarns. 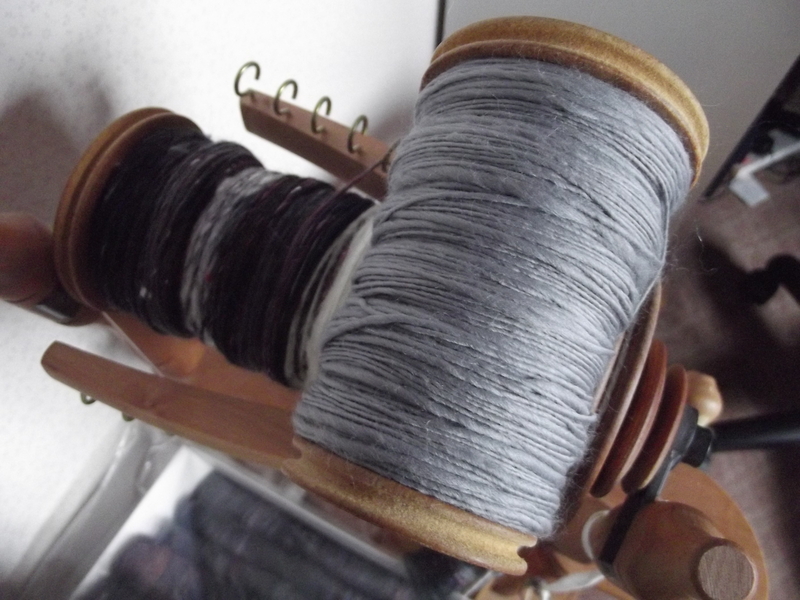 The first is a combination of the rolags I bought at Festiwool, Hitchin and some grey merino I had in my stache. 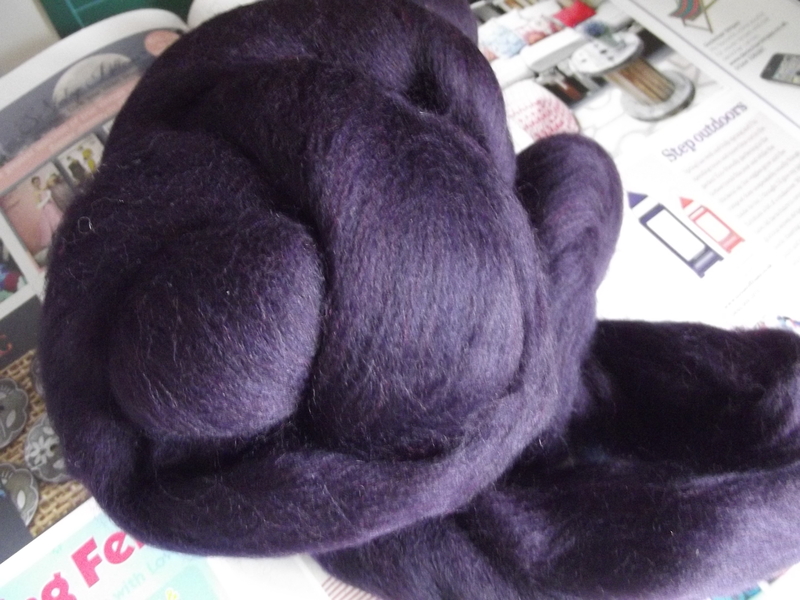 I also have some purple and grey merino which I will work in. The flash sure makes a difference, doesn’t it. The first pic is very accurate. This project will not be finished quickly. 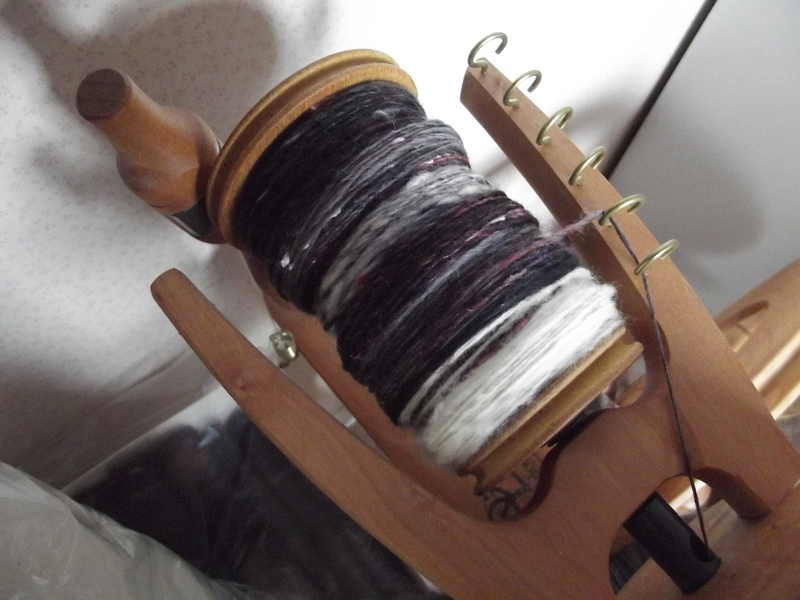 I am still spinning the wool into yarn and in between I am working on other projects. However, I will come back and show you as and when I finish each section. 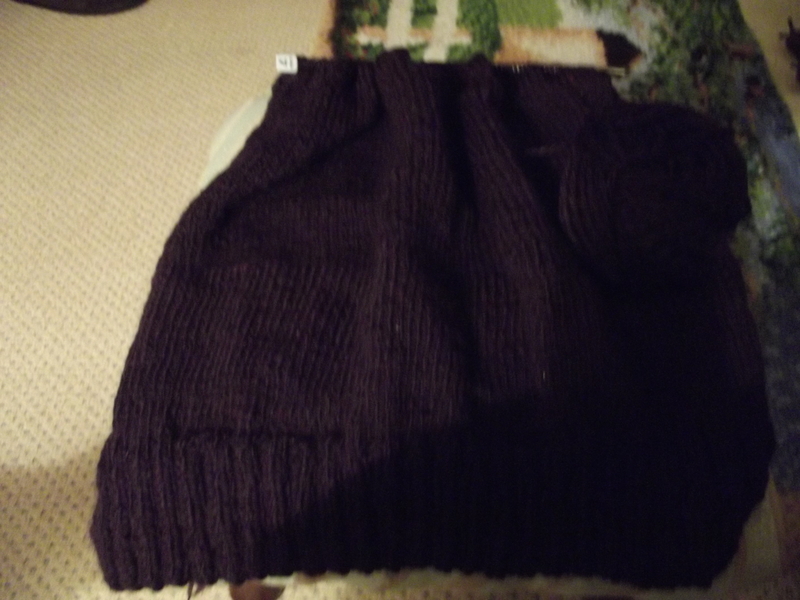 I don’t have enough of the purple to finish the back so I may use the mixed purple and grey from the armholes up. Let’s just wait and see shall we. 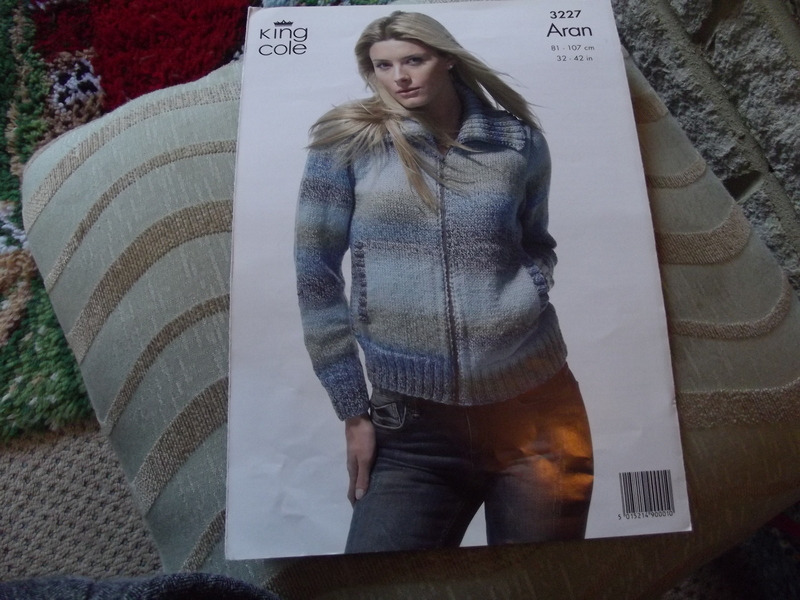 Meanwhile, five weeks to go until my new grandchild appears. It’s getting exciting. Pity they are in South Carolina. We won’t be visiting very soon! 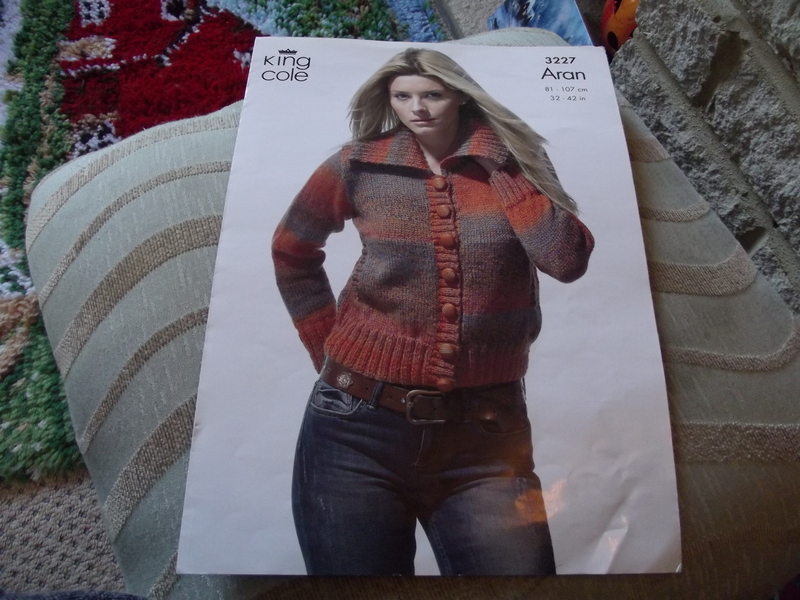 which is available as a button-up or zip-up version. 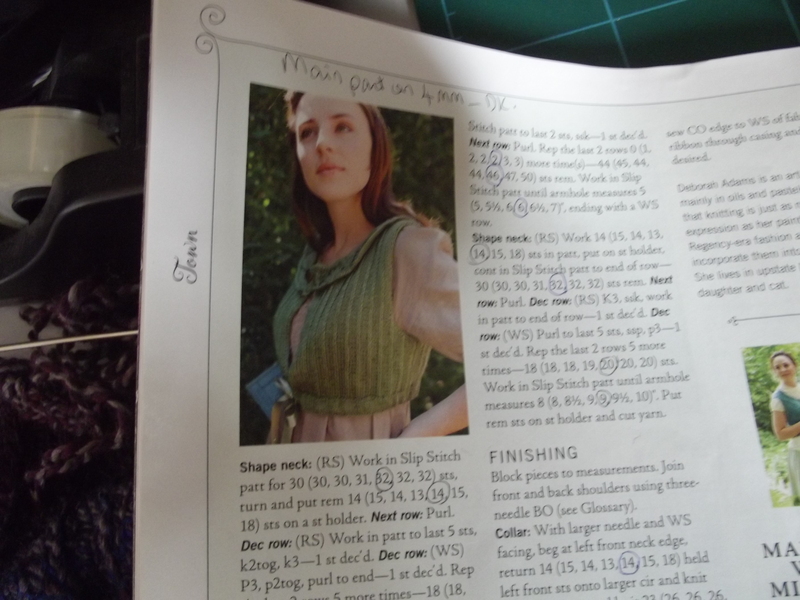 I shall make the button-up version this time. 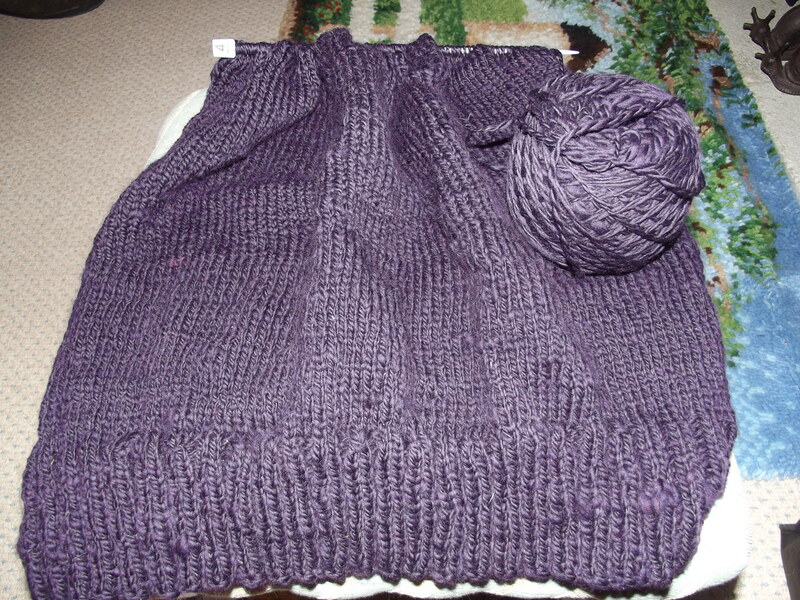 I have made a start, knitting the back, up to the armholes, in a purple yarn which I had spun up ready. 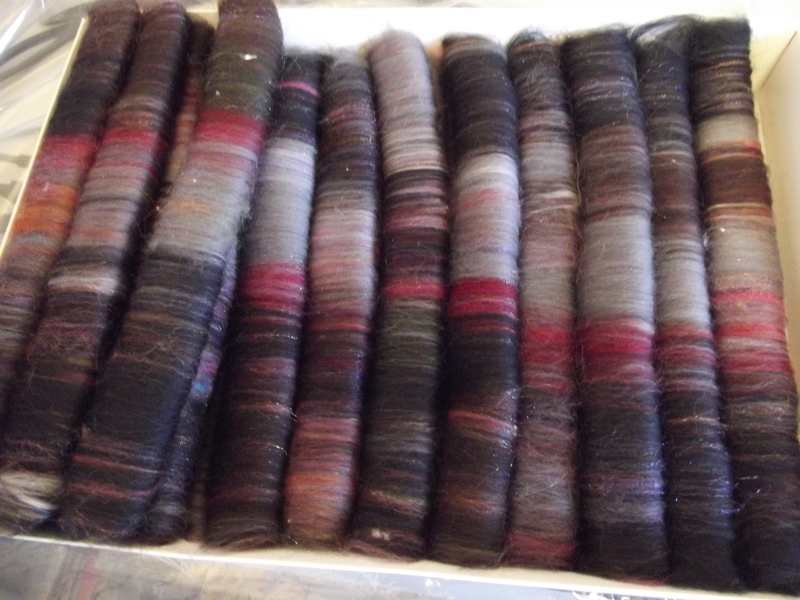 I don’t have enough of the sparkly rolags to make the whole cardigan. 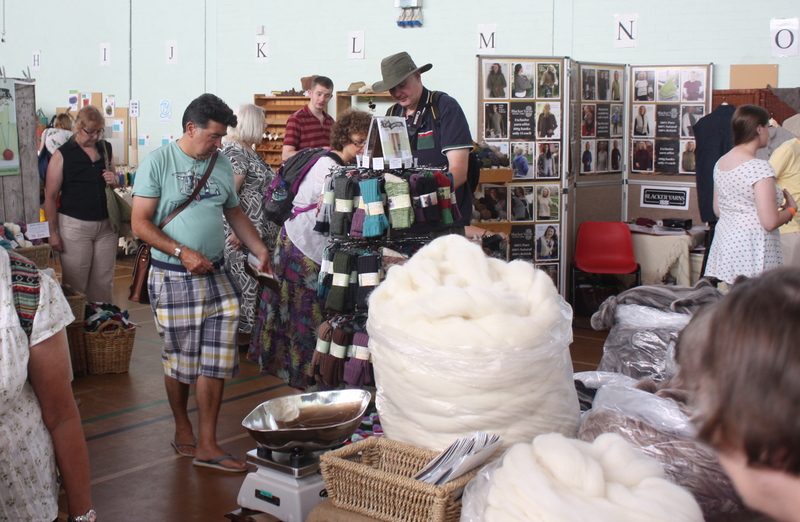 If you would like to see more of the Festiwool get together, you can click here. 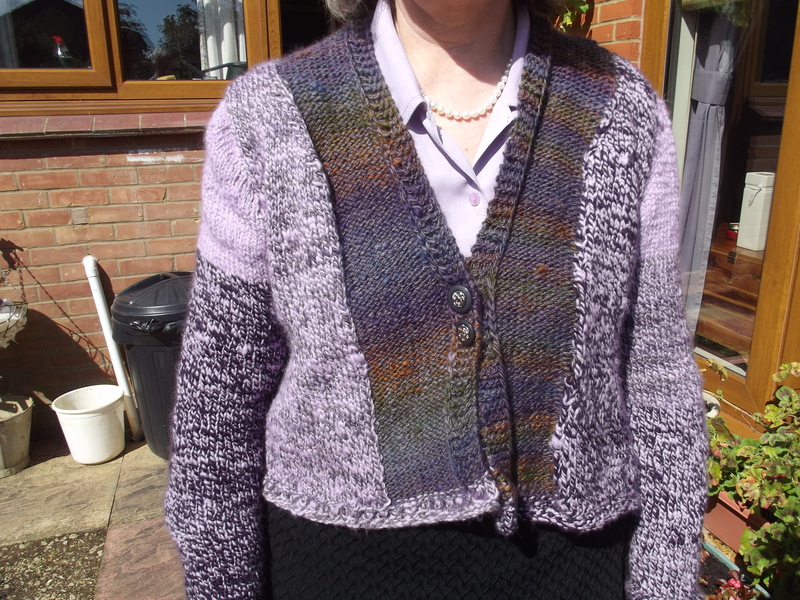 I’ll let you know how I’m getting on with the cardigan in a future post. 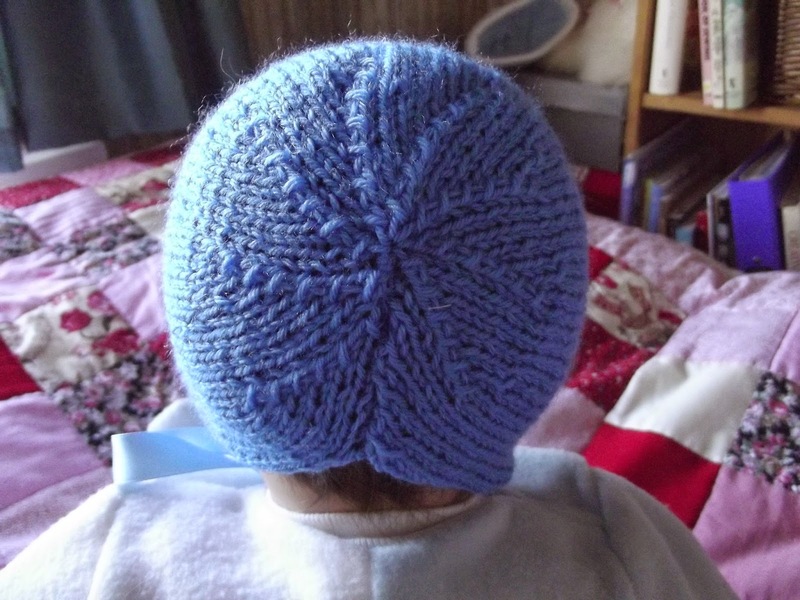 Little hats for little heads. 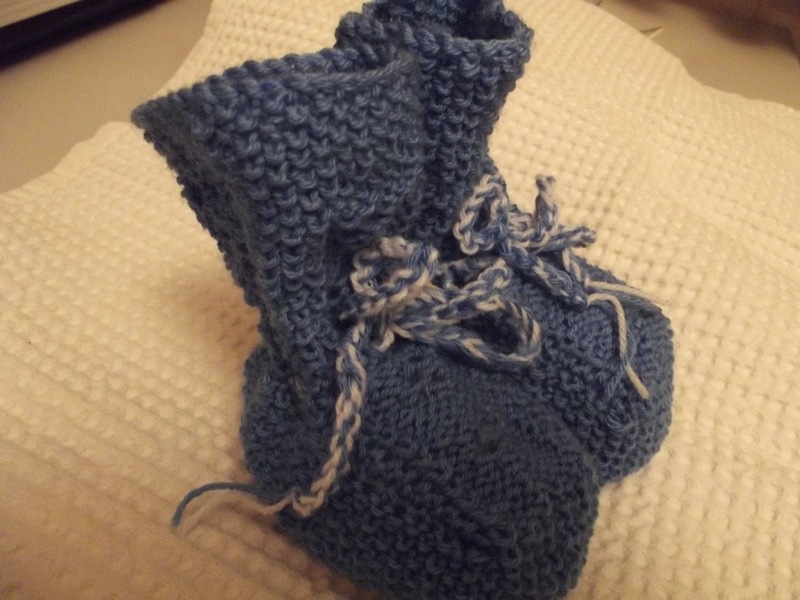 In nine weeks time I shall be a grandma (Oma) again. 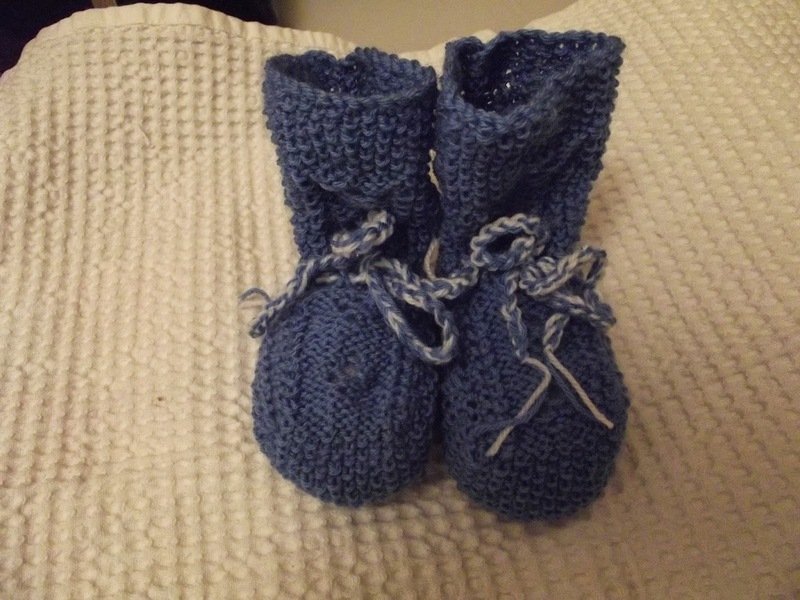 Larry’ s son and daughter-in-law are expecting their first child, a boy, in February so the knittting needles are out and a little hat and bootees have appeared in the last few days. What am I making this week? 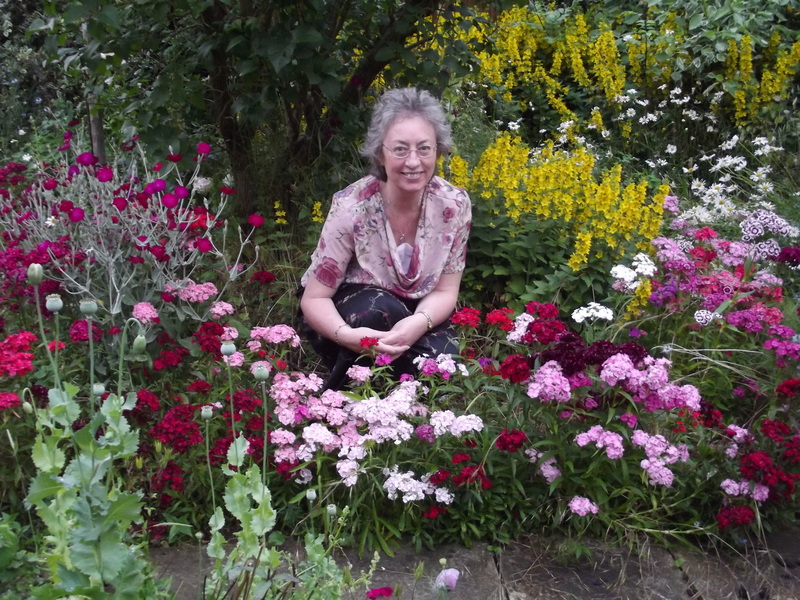 Well it’s nearly Sunday again and Sunday is gardening day here in the cottage. Today we had some much welcomed rain. In fact we had today half the total rainfall for the whole of September. Amazing! 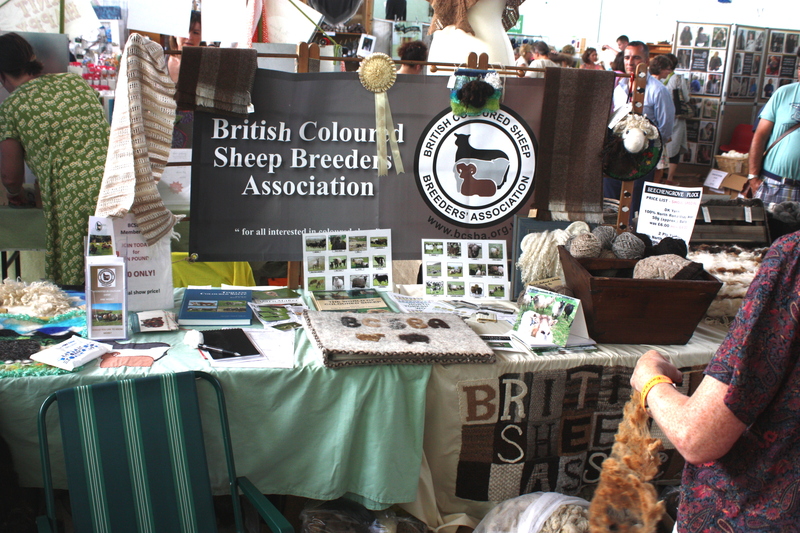 The picture above shows the fifth dog blanket I am making for Battersea Dogs’ Home. 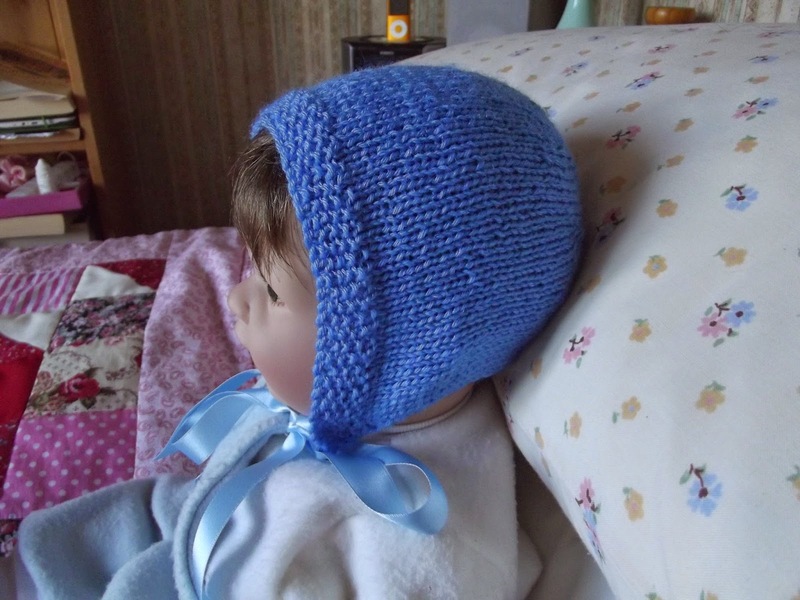 This one is going to be in different shades of blue and is made in an ever popular blanket stitch. The home likes this because the dogs can’t get their paws caught up in it. 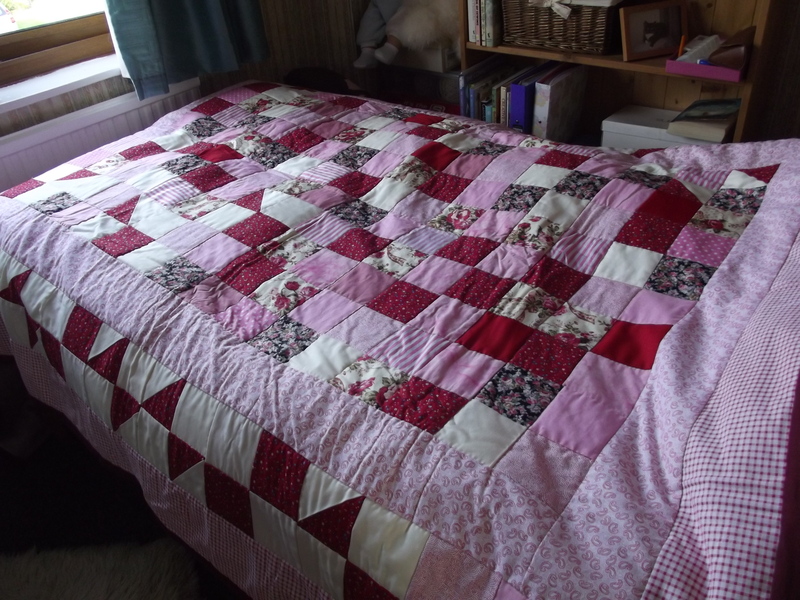 My new quilt is finished and now on my bed, ready for the cold nights ahead, which we have been promised! I can’t wait to see how it comes out. 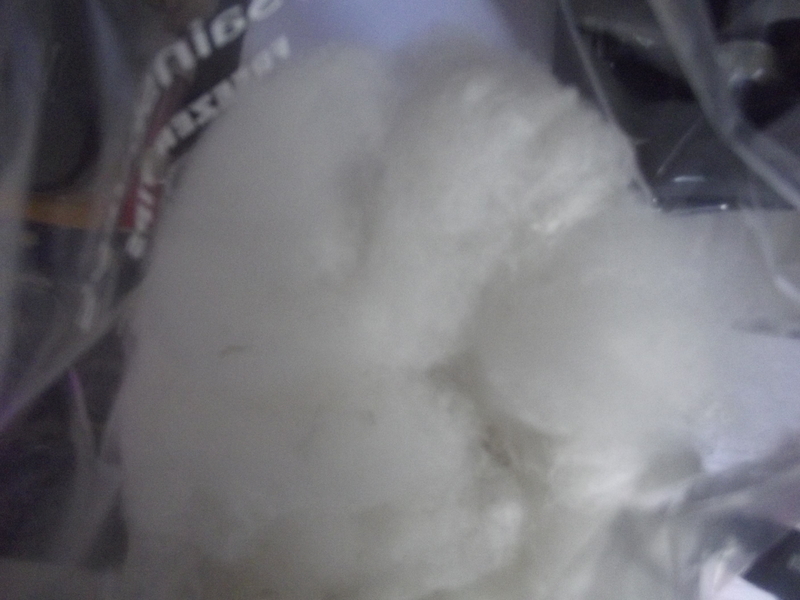 On my spinning wheel is some of the white Polworth fleece and I’m already making a jerkin with some of it, see below. 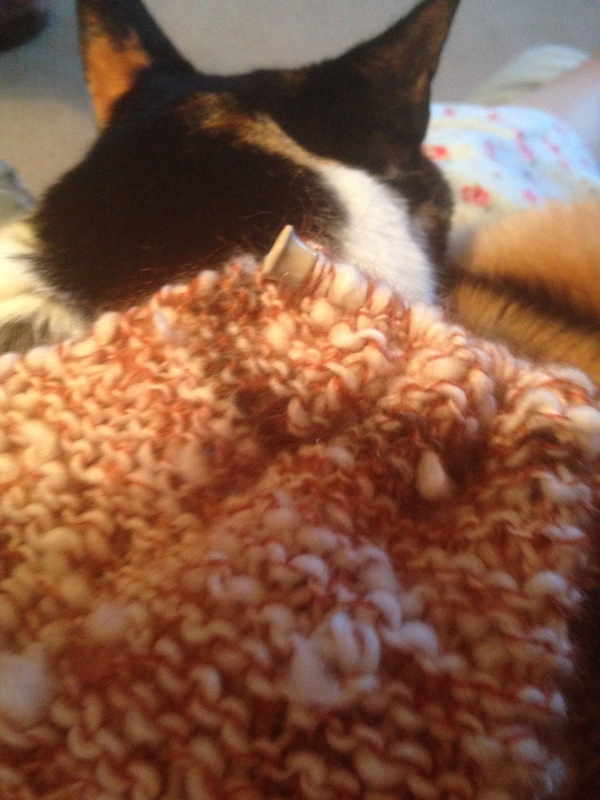 Millie likes it because it is so warm so she is usually to be found curled up underneath while I’m knitting. 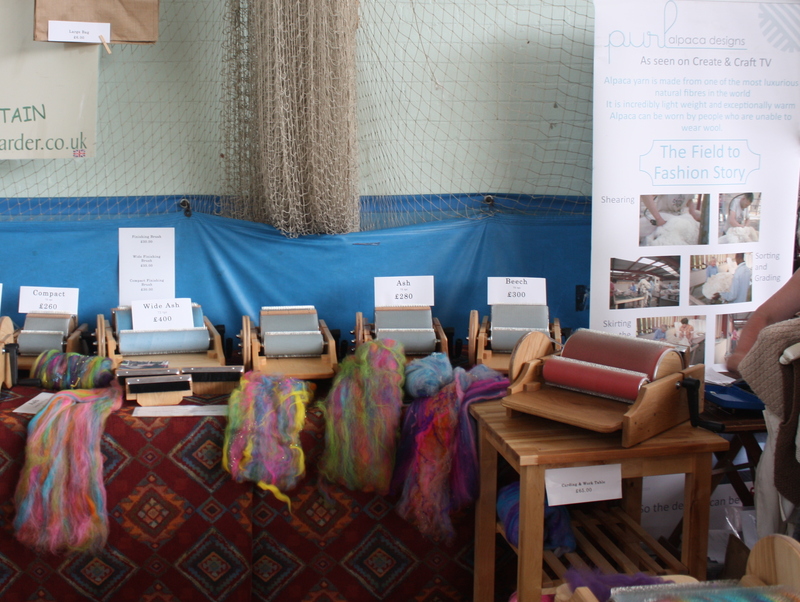 So another busy week and tomorrow we’ll be in the garden. ps there is a little good news about my son. He has found someone to share a flat with, albeit on the sofa! and he is training for a job in customer service with a well known bank. I have hope ! 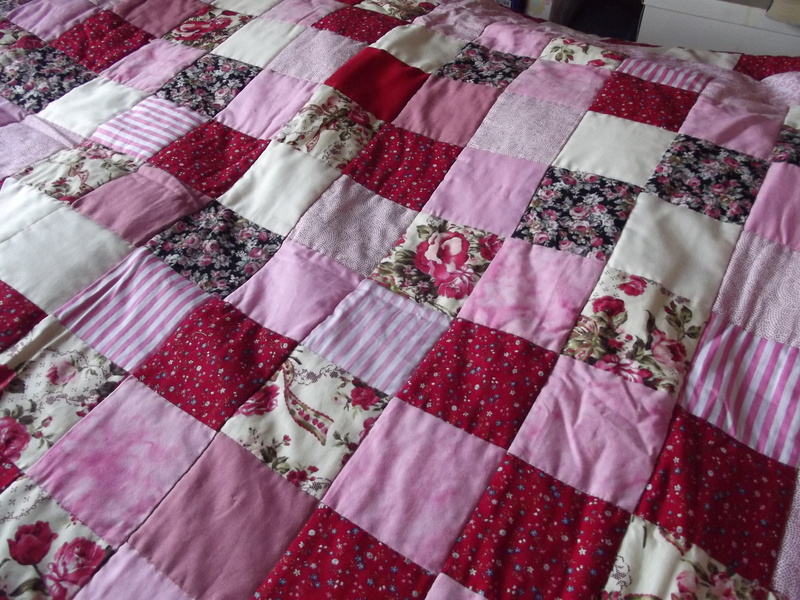 This is my latest finished project. 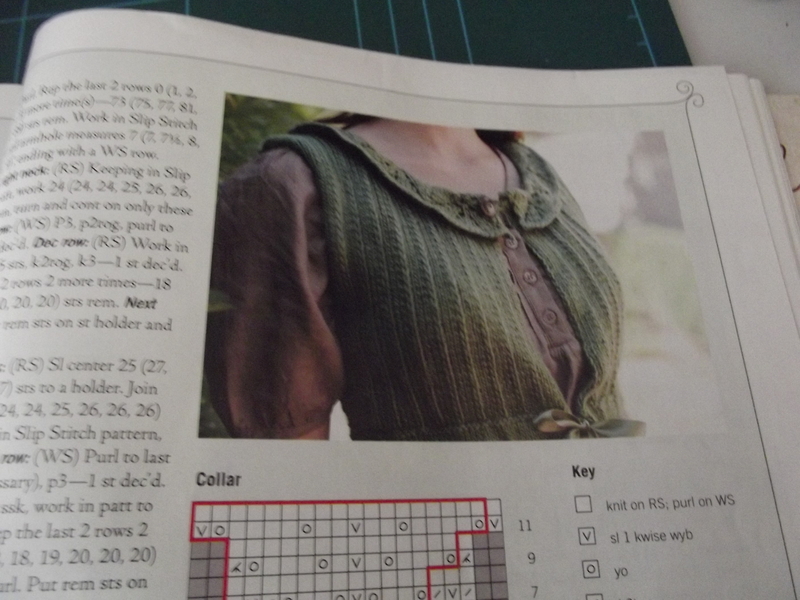 It’s called’Fanny’s Chemisette’ and it comes from the Fall 2012 edition of Jane Austen Knits magazine. 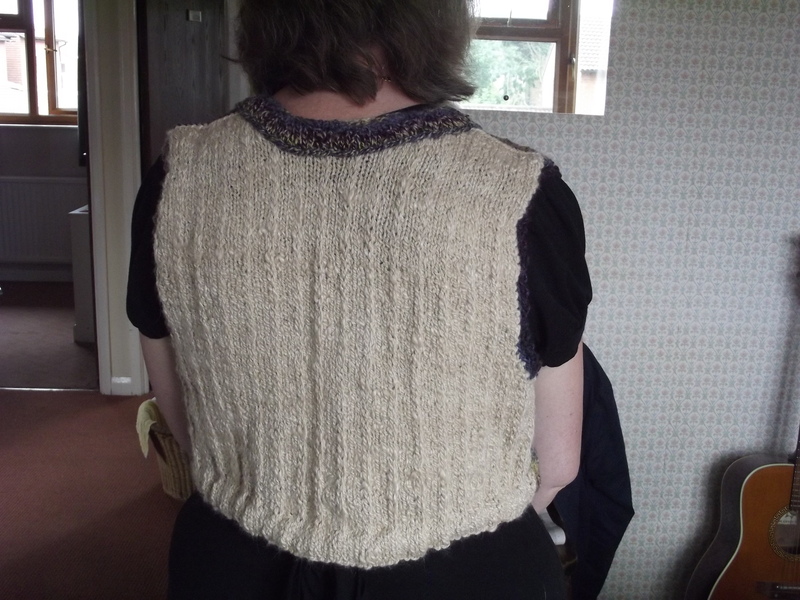 I had some handspun (by me) alpaca/silk yarn, which I used to make up the back of the bolero. 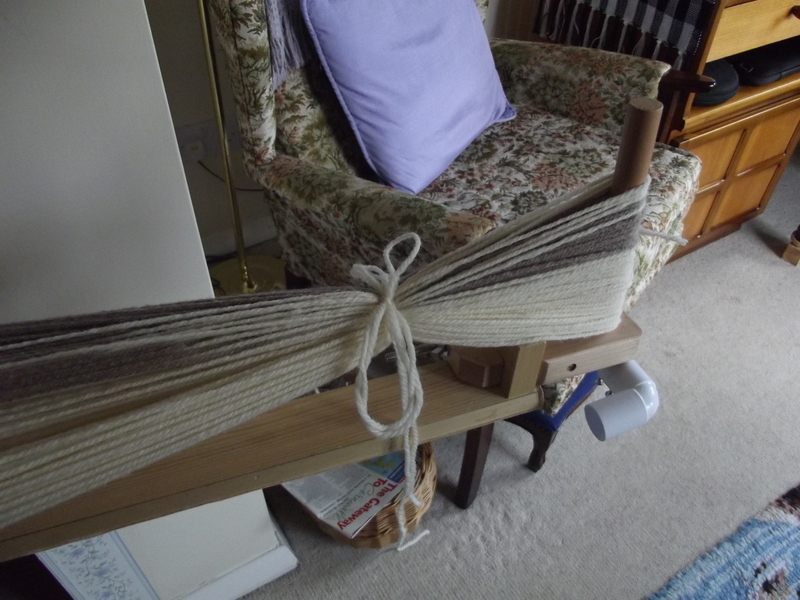 It is heavy and hangs really well, caught up by the tie at the bottom. I used a crochet tie not ribbon as stated in the pattern. 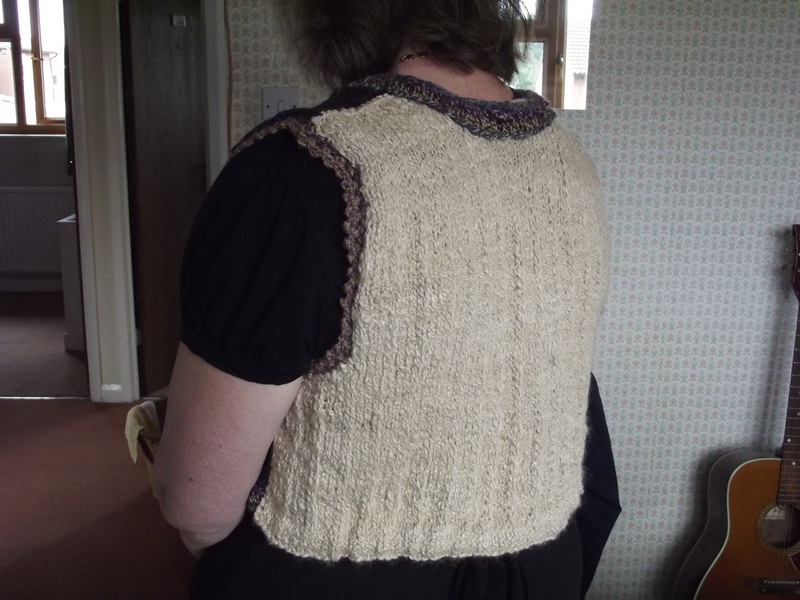 I didn’t have enough handspun alpaca/silk yarn to do the whole bolero and I think it would have made it too heavy so the front is worked in a purchased Sirdar yarn called Escape. 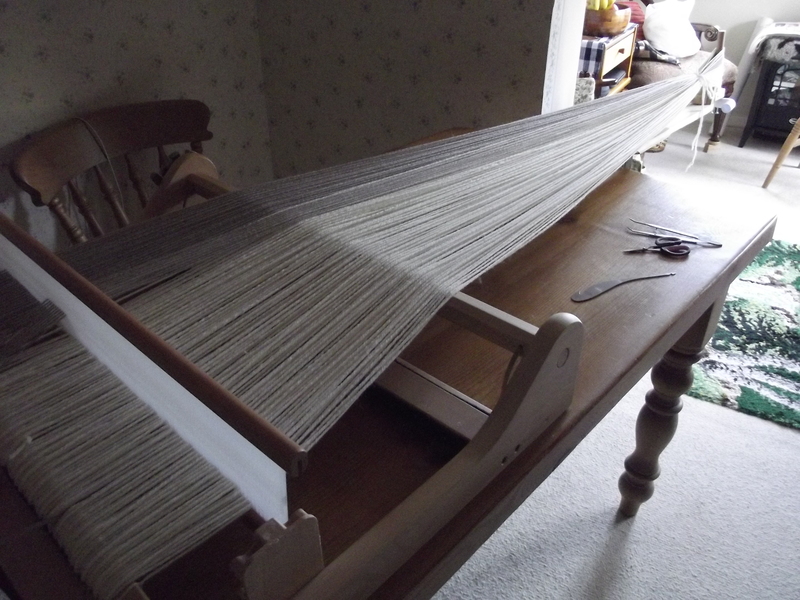 I used the DK weight. This is the back. 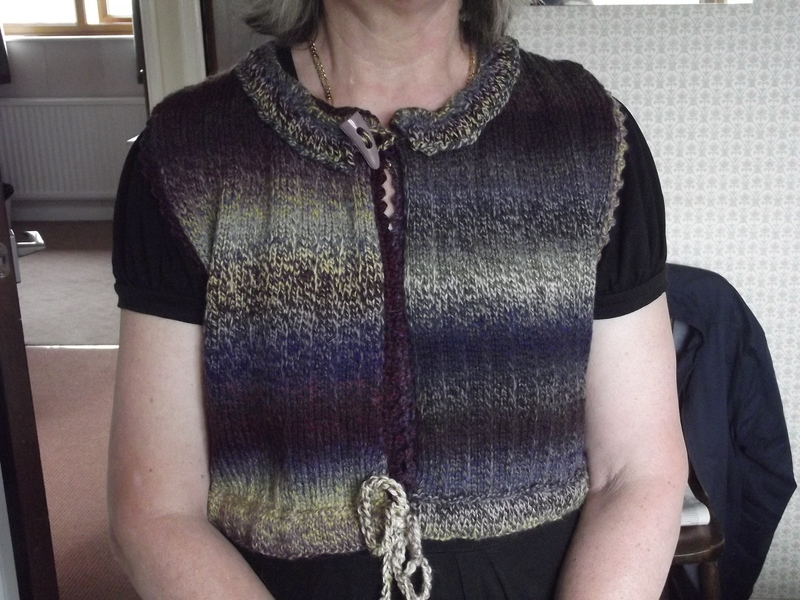 I crocheted a picot edging around the sleeves because I felt it looked prettier and I stitched down the collar with large tacking stitches to stop it sticking up and being a nuisance. 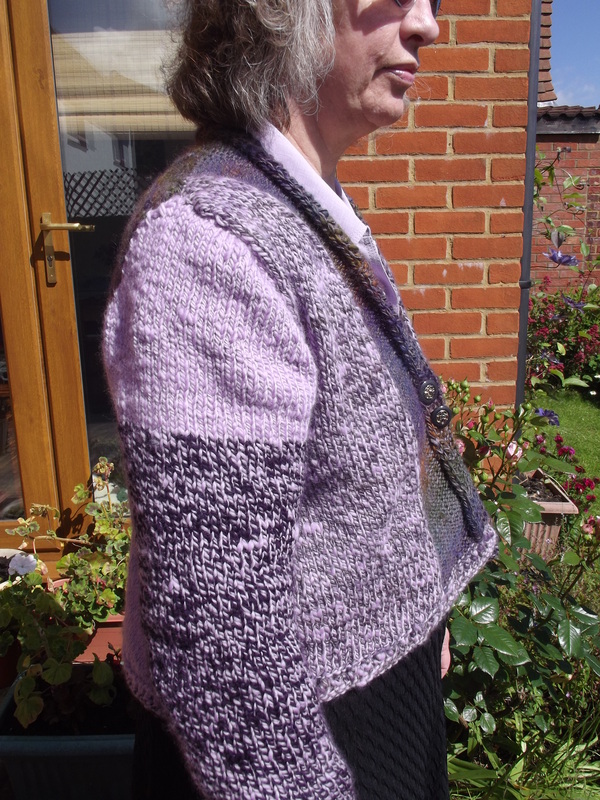 The bolero is very comfortable to wear and gives that extra bit of warmth for the evenings. 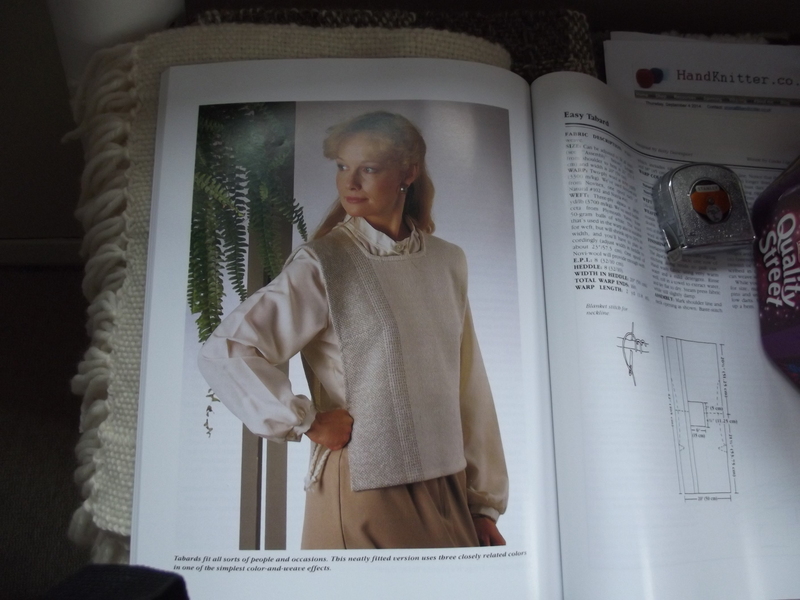 I recommend this pattern to anyone who wants to make a bolero. 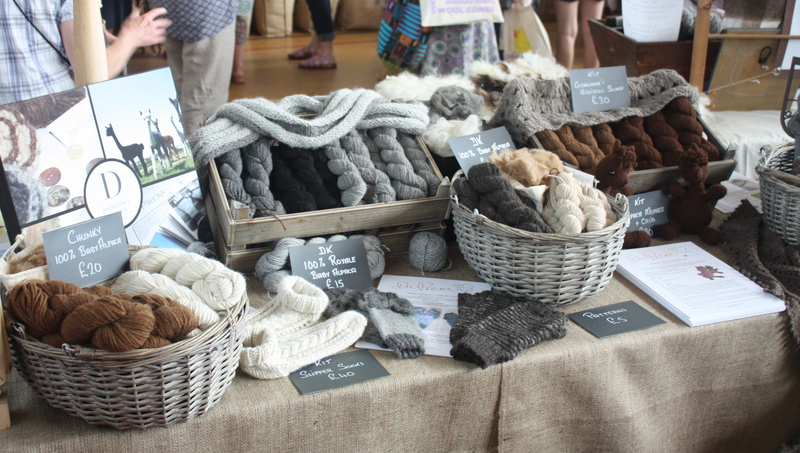 Fibre-East Festival, 27th July 2014. 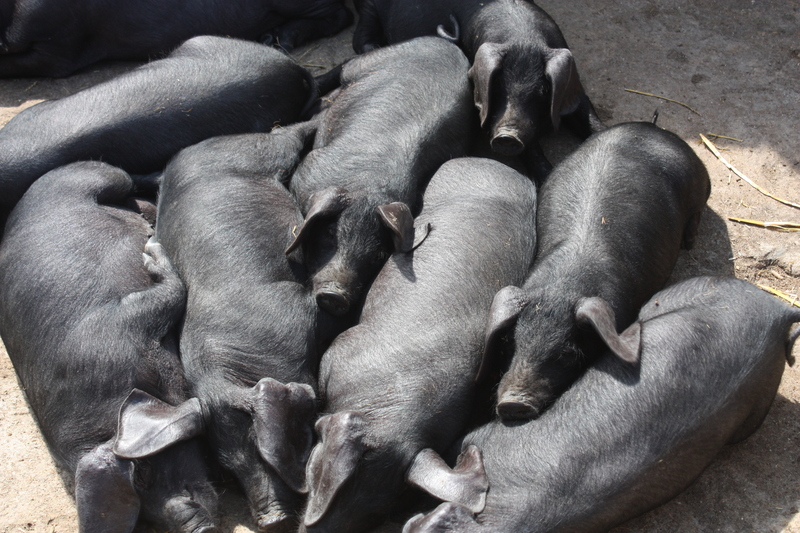 These delightful black piggies were part of my day last Sunday, when Larry and I went to the Fibre-East Festival at Redborne Upper School in Ampthill. 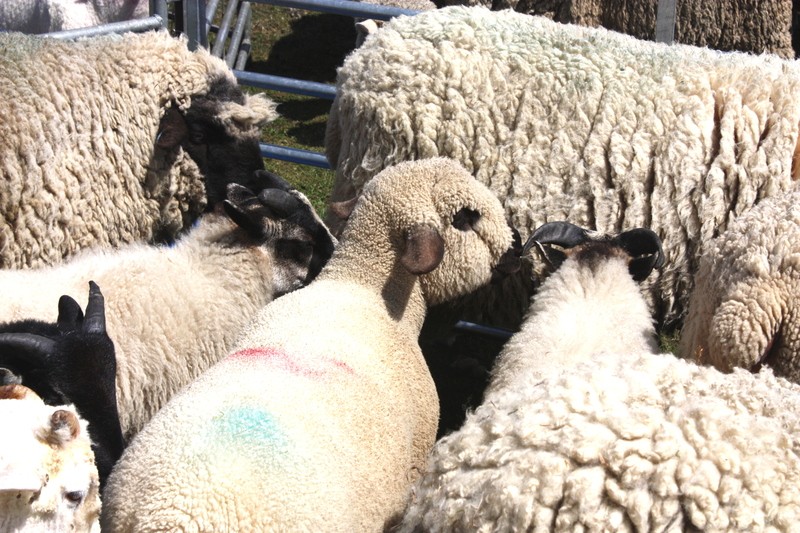 There is a farm on the school where the pupils can learn animal husbandry. 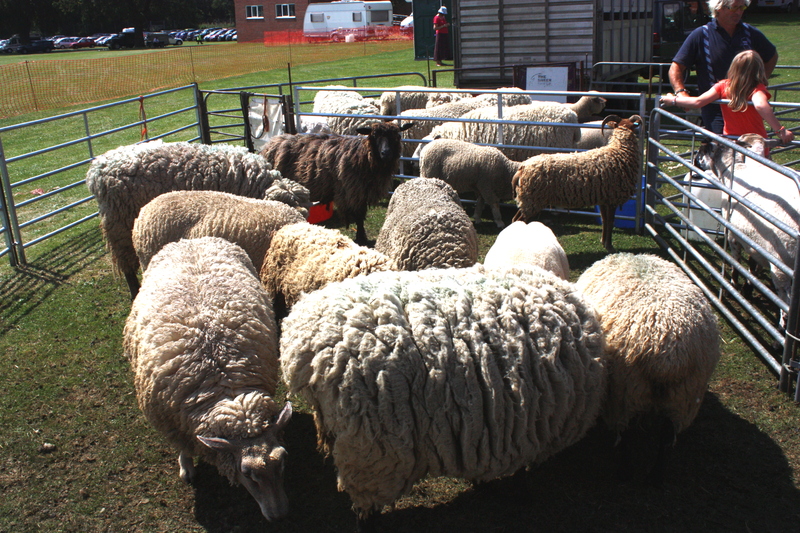 The animals were extremely well kept and happy and the pig-house even had piped music installed to keep the pigs entertained. 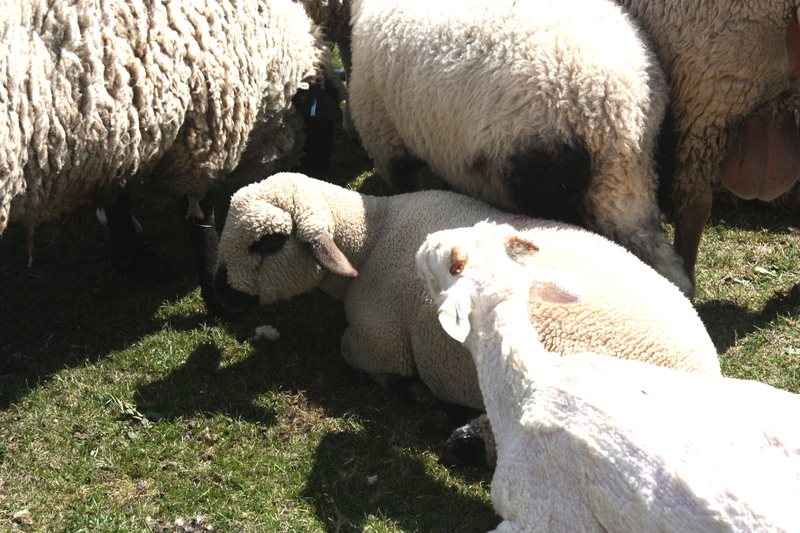 There was a farm shop, where I bought some fresh eggs and some honey and in the freezer there were all sorts of home produced meats. 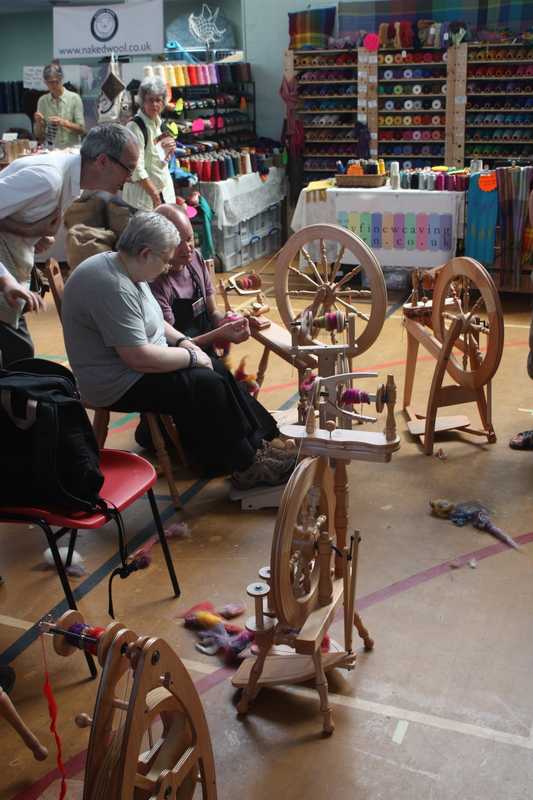 Here are some pictures of the fibre festival itself. 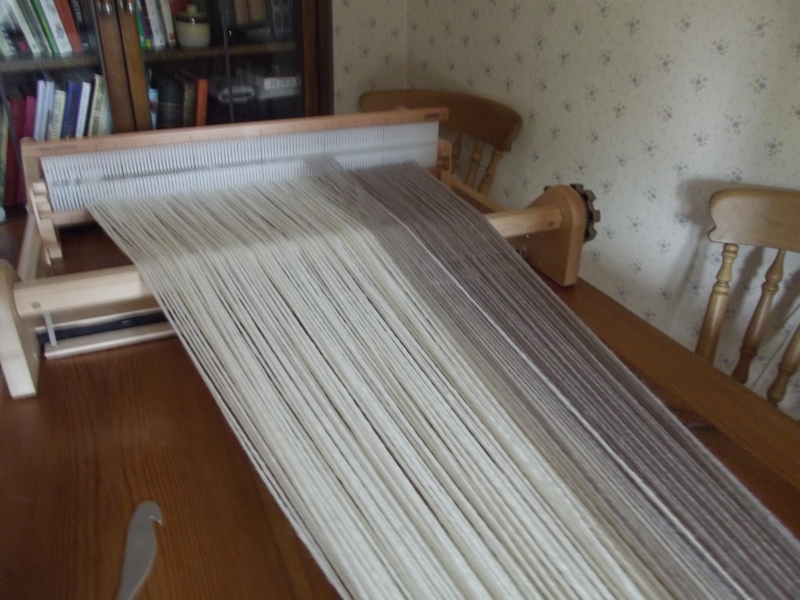 Larry and I had a wonderful time looking around and it has inspired him to take up weaving! 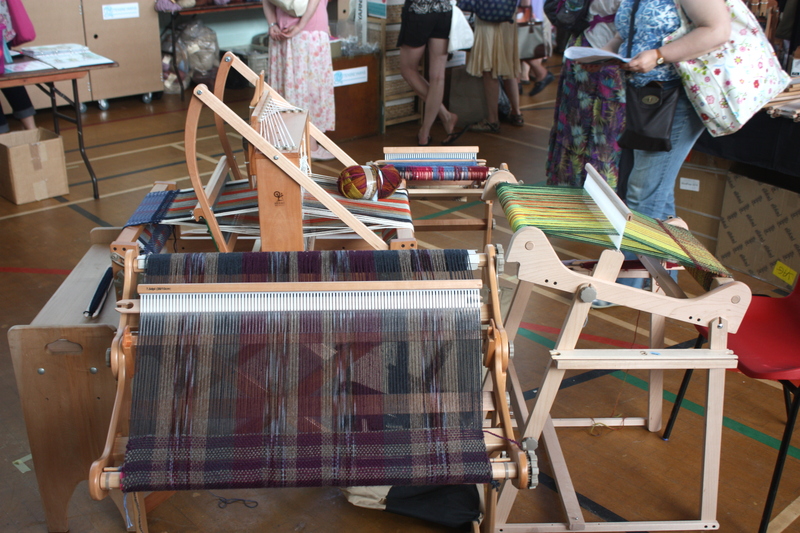 There were weaving looms galore. 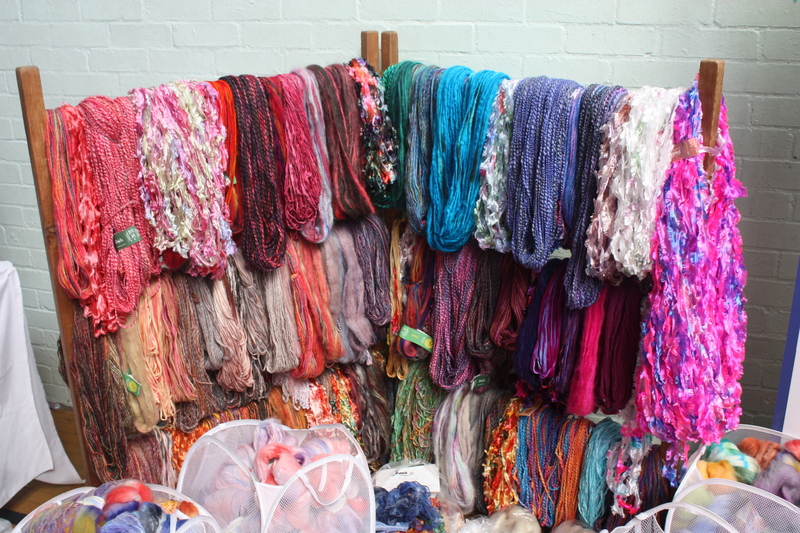 Lots and lots of yarn. 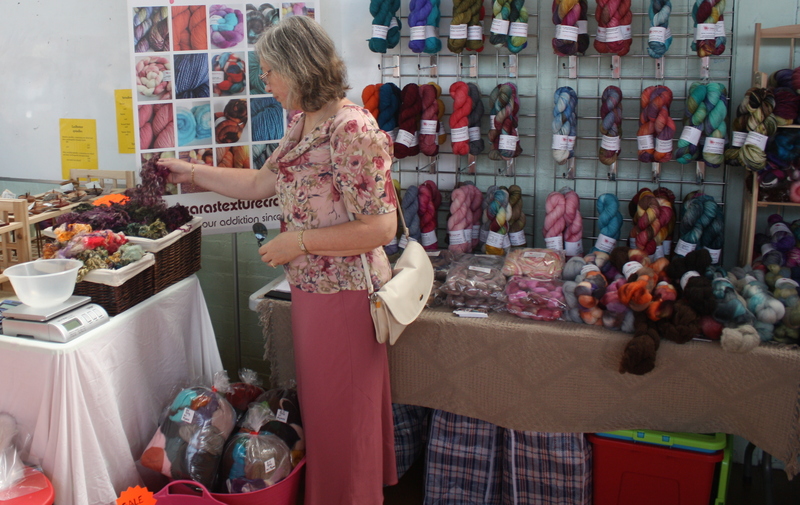 Here I am checking out some wonderful, purple art yarn. 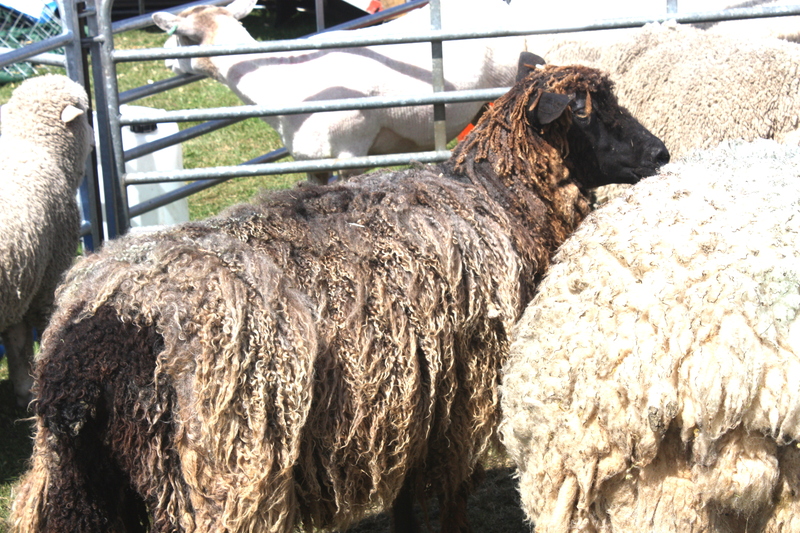 Bales of roving in all natural colours and livid ones too. 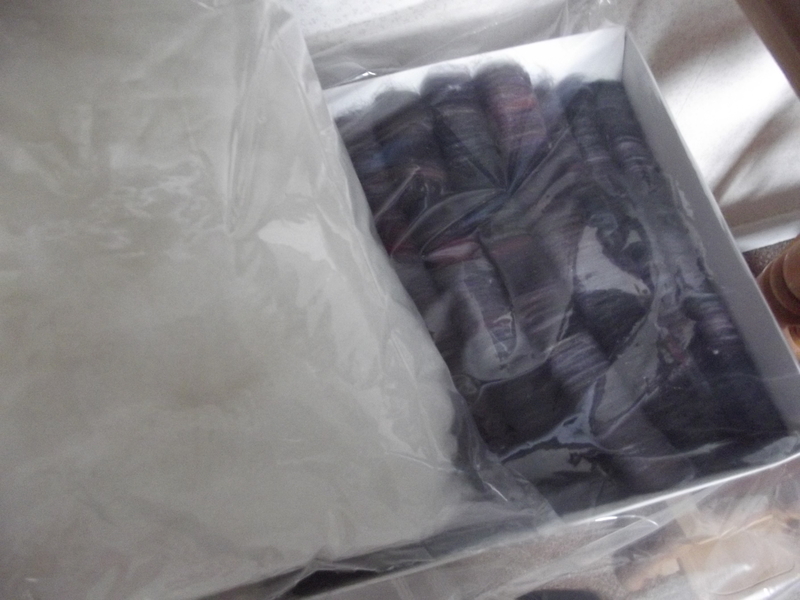 I was interested in those but they were very expensive. 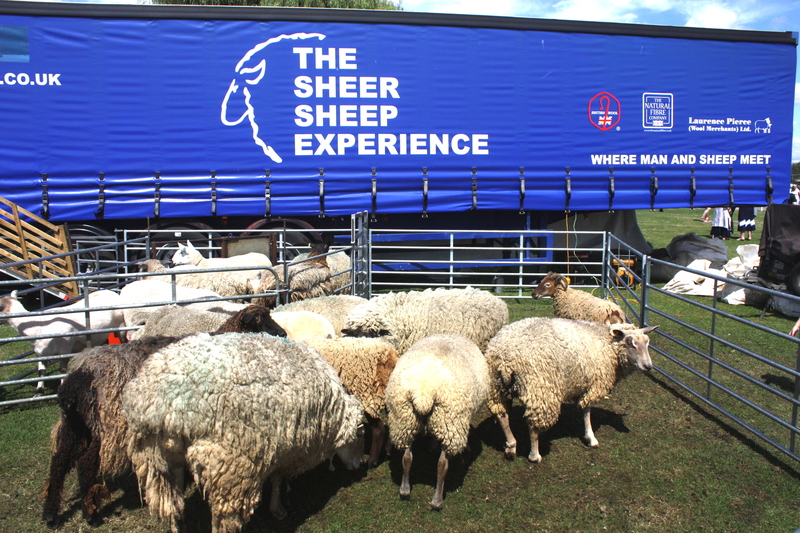 and of course there were sheep! 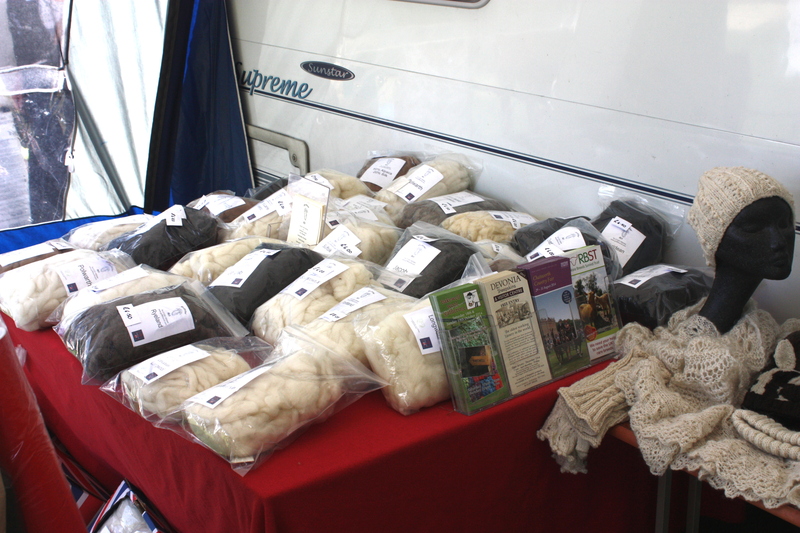 and the fleece was for sale too. I didn’t buy one. I am still working on the one I’ve got! 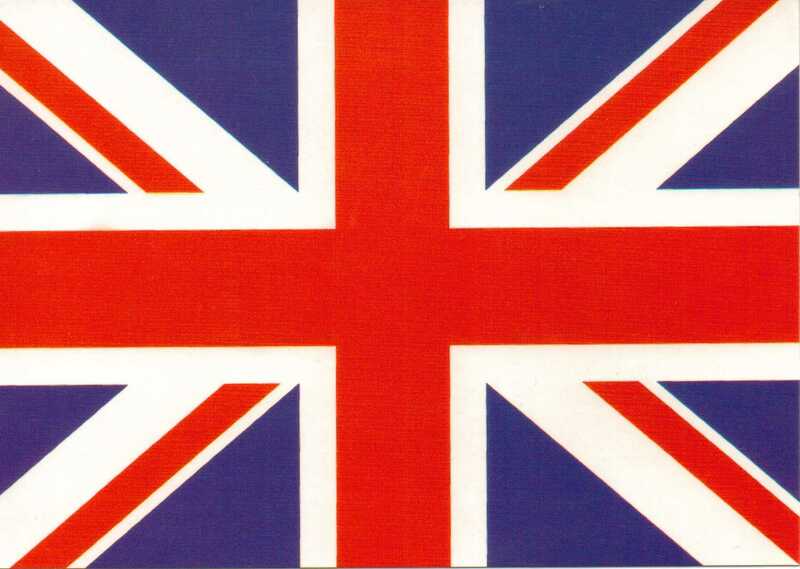 Have a great weekend, whatever you do! 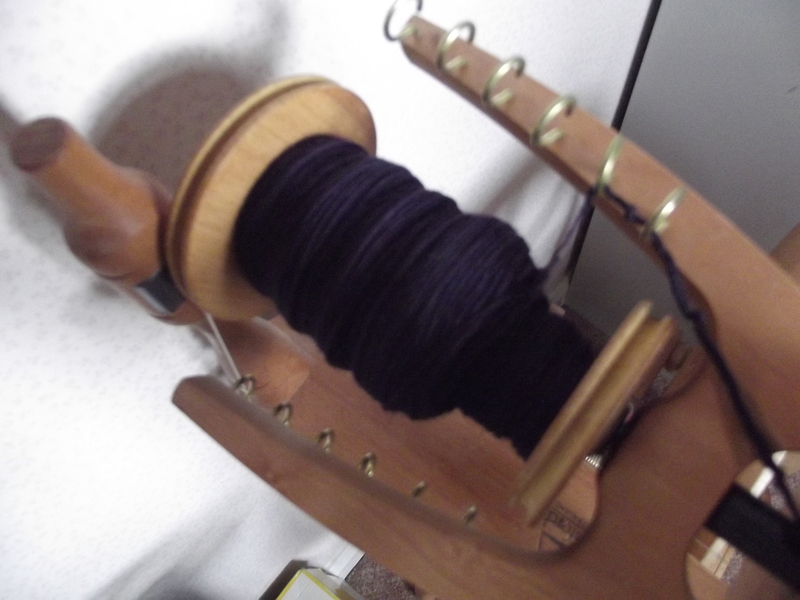 Spinning and Knitting Project finished. 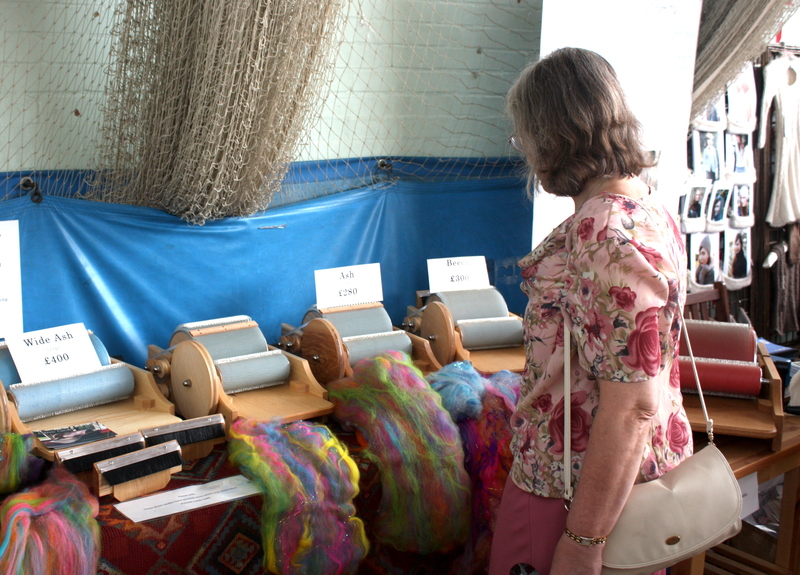 The above four yarns were spun by me during the last year. Question was: what to do with them when they are finished? Answer: find a pattern that you like and adapt it. Easier said than done. 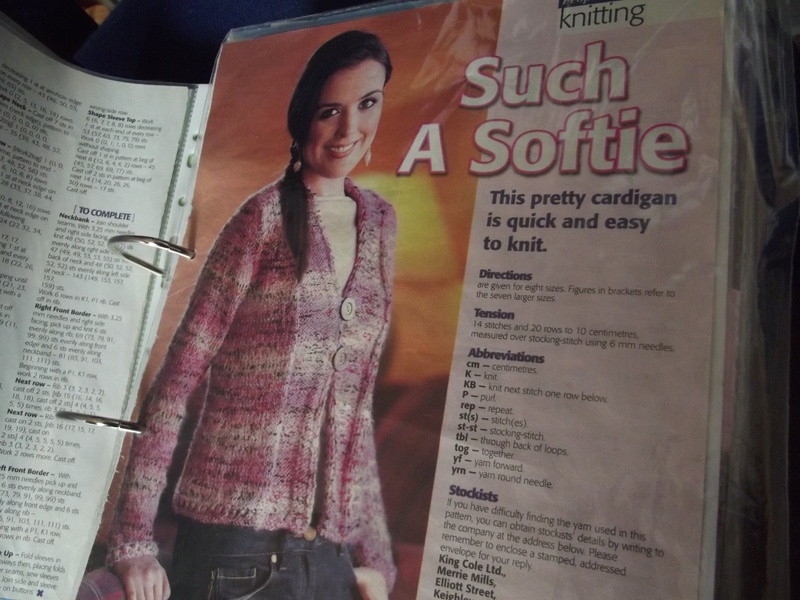 Then I saw this pattern in an old ‘People’s Friend’ magazine. I thought it would be just right. 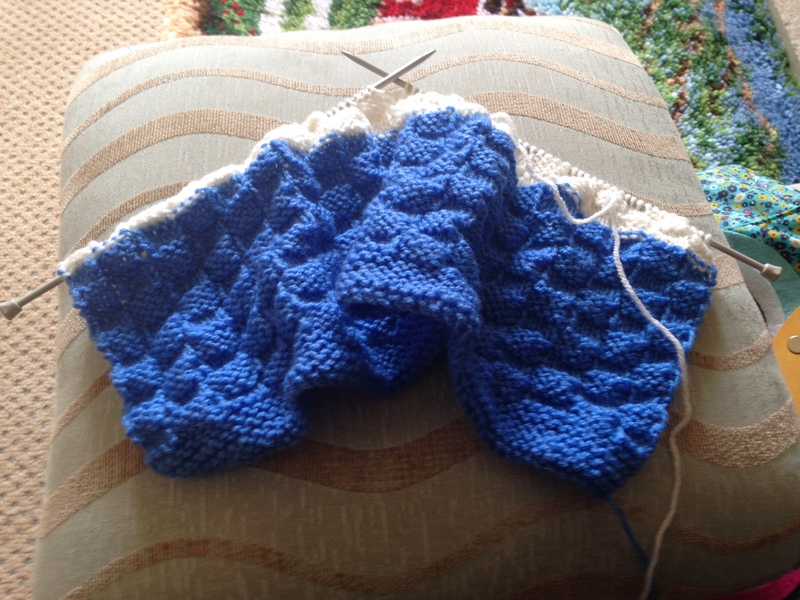 It was just right for someone short-waisted, like me, and lots of opportunities for using more than one colourway. 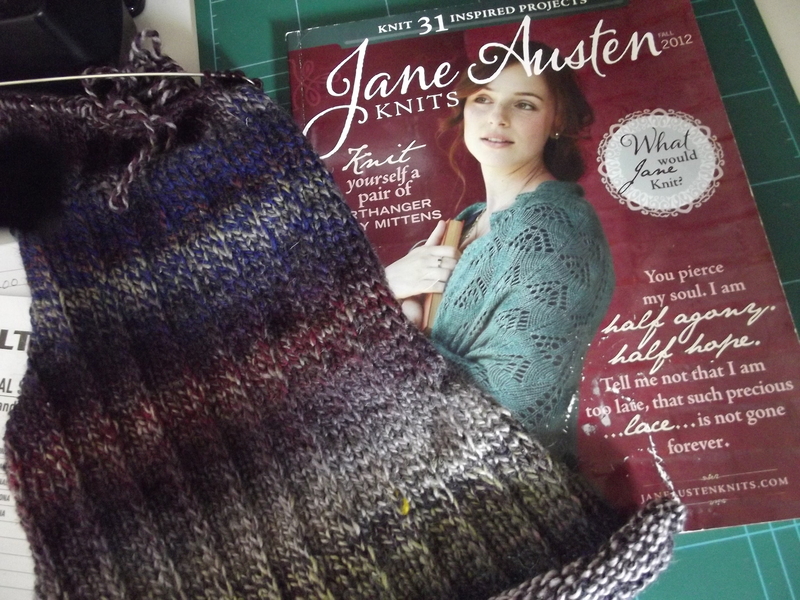 My spun-off merino knits up like Aran so knitting with 5mm (u.k. needles) I began. 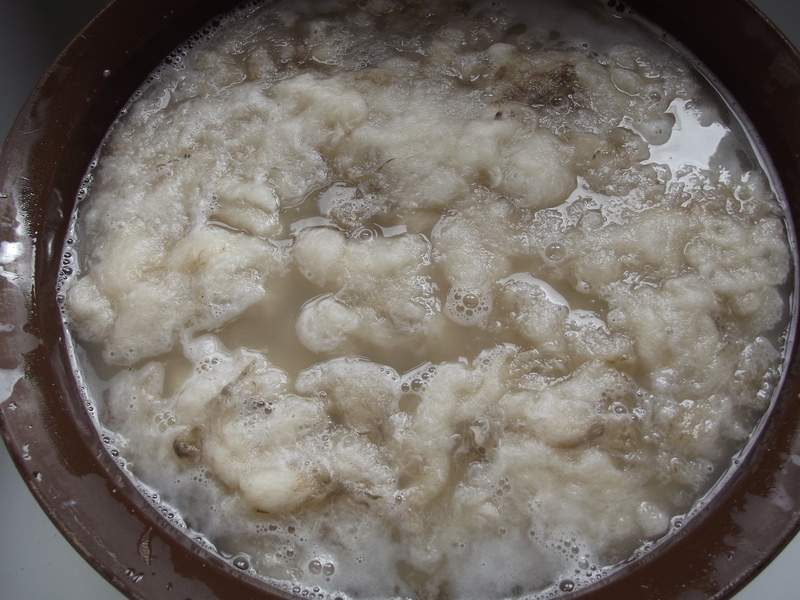 …and here is the finished result. I’m pleased with it. It’s not at all itchy and very comfortable to wear. 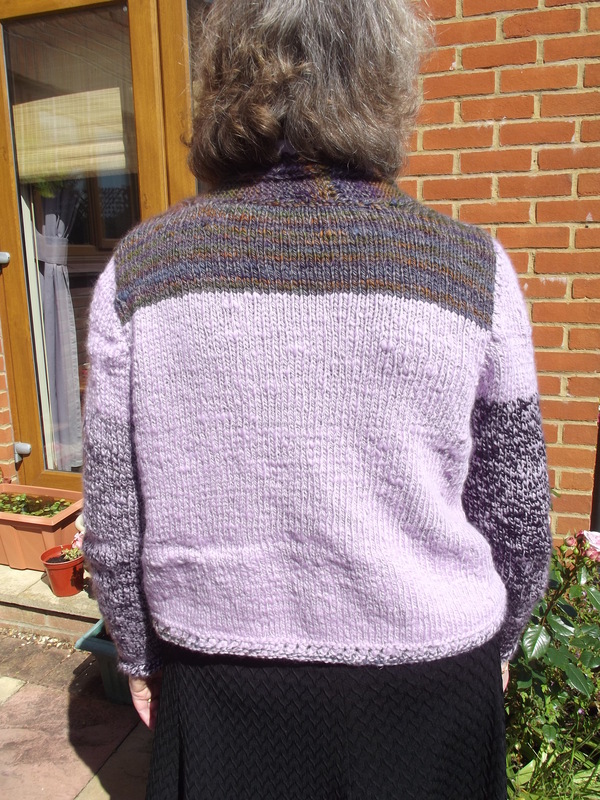 The colour panel at the back breaks up the vast expanse of lavender yarn and compliments the front panels. I like the way it sticks out at the front. 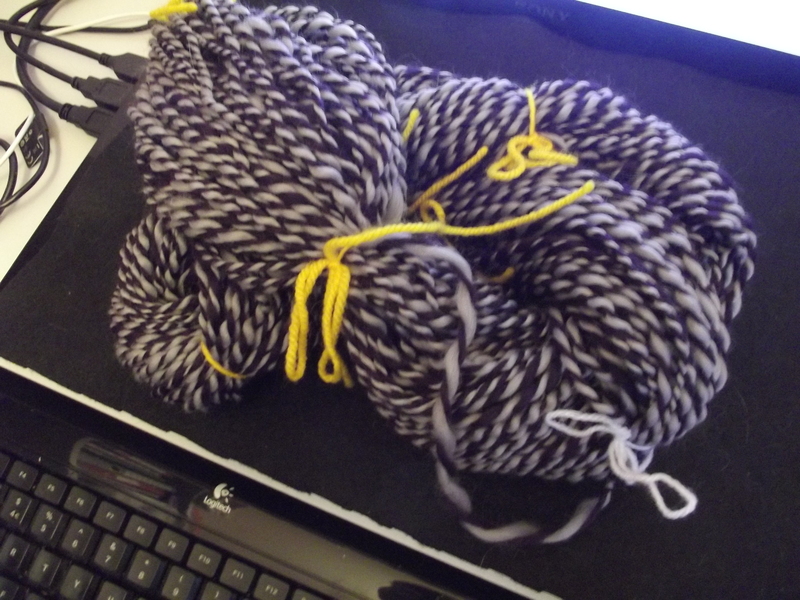 Now on to my next project, but first I need to make something with the left-over yarn from this one. Any ideas?